Some marketing pundits claim that email marketing is one of those fringe 'Outbound Marketing' strategies largely on the way out. But is it, really? We believe that this may not be the case now that it begins to soak in that consumers are empowered with the ability to directly control the sources of email streams with the ‘unsubscribe’ link mandatory in each commercial email subscription. (14%) Trial Phase – no process or planning of an email strategy. Obstacles to Email Marketing Success. Feedback from surveyed organizations indicated that the biggest obstacle to success wasn’t in determining their campaign’s ROI, or getting people to opt-in, but was in delivering extremely focused content. This is because of the time investment required to generate it. 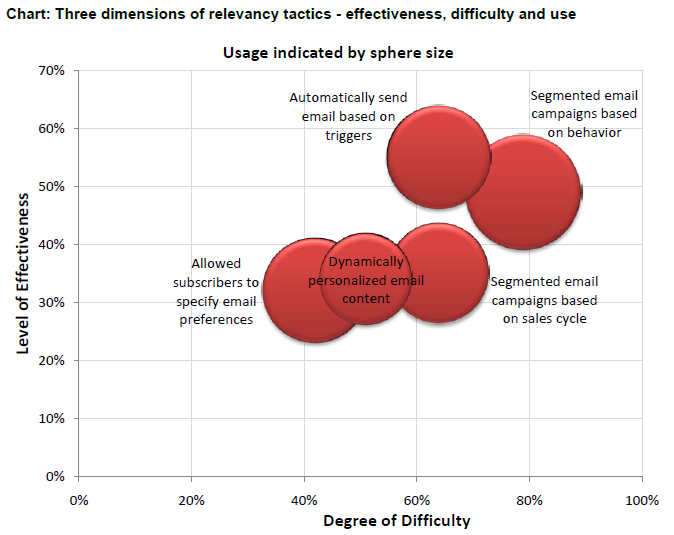 Top Tactics for Delivering Relevant Content The chart below is particularly interesting because it illustrates that although a segmented email strategy is less effective and more difficult to implement that email automatically sent by trigger, it is more widely used by marketers (indicated by sphere size). Email Marketing Metrics Tracked. It was interesting to see that the data indicated that 90% of companies focused on open rate. Since open rates are typically determined by the number of recipients opting to download images in the email, it seems surprising that so many organizations rely on this metric since it is not clear how many people actually download email images. Interesting. While we have not reviewed the entire report yet, it seems email marketing is still an important part of our inbound marketing toolbox and there are ways to make it work well. Our advice is to put serious focus on your email campaign and the results will follow. What sort of results are you seeing in your email programs? Does the data above resonate or do you have different experiences? We invite you to download our free white paper, The 10 Essentials of Effective Marketing Online for more information on how to succeed at inbound marketing.